Peanut Butter and Jelly. Batman and Robin. Bacon and Eggs. Those are pairings that just make sense. But airplanes and tombstones don’t. Not usually. Hartsfield-Jackson Airport is what most people think of when you mention Atlanta (hopefully it’s not those trashy TV housewives). Just about everybody can say they’ve been through Atlanta because of it, even if they never left the building. They don’t call it the World’s Busiest Airport for nothing. Amid great hoopla in 2001, construction of a new fifth runway began. The final cost was around $1.28 billion dollars. Completed in 2006, it involved enough fill dirt (in some places) to reach 11 storeys high. That fill dirt has its own whiff of scandal attached to it, but I digress. By putting in that runway, what little was left of the Flat Rock community that sat on that property was erased. Fortunately, two cemeteries with deep roots in that area were kept intact. While they both look drastically different, not a single grave was disturbed. He’s being kinder than I would be if someone bulldozed my grandmother’s house to put in a runway. 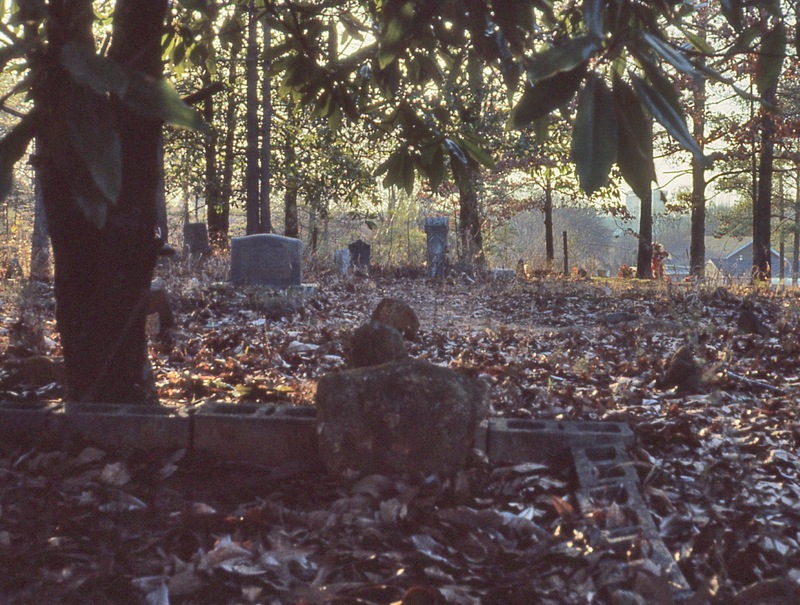 This is what Hart Cemetery looked like in 1984. Photo courtesy of Tomitronics.com. My mother worked for the Delta Employees Credit Union for 15 years. I frequently drove to the airport from Fayetteville and passed through this area, although I had never visited the cemeteries. So when I was recently over that way, I decided it was time to do so. A sign on Riverdale Road directs you down the short road to the bottom of a deep embankment. 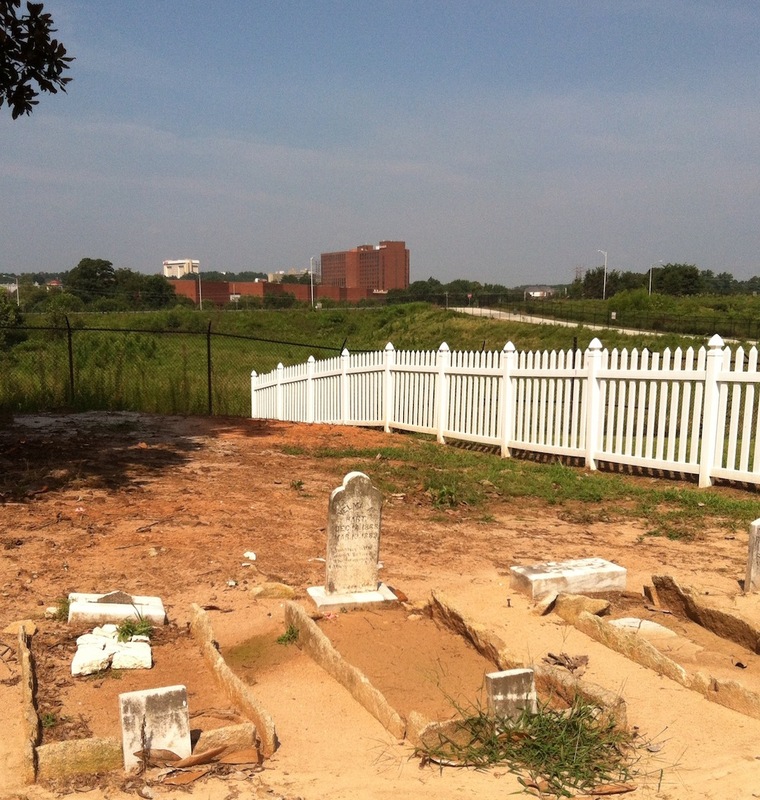 The front of the cemetery is bordered by a white picket fence and landscaped with bushes. A sign details the history of the cemetery and lists every person thought to be buried there. 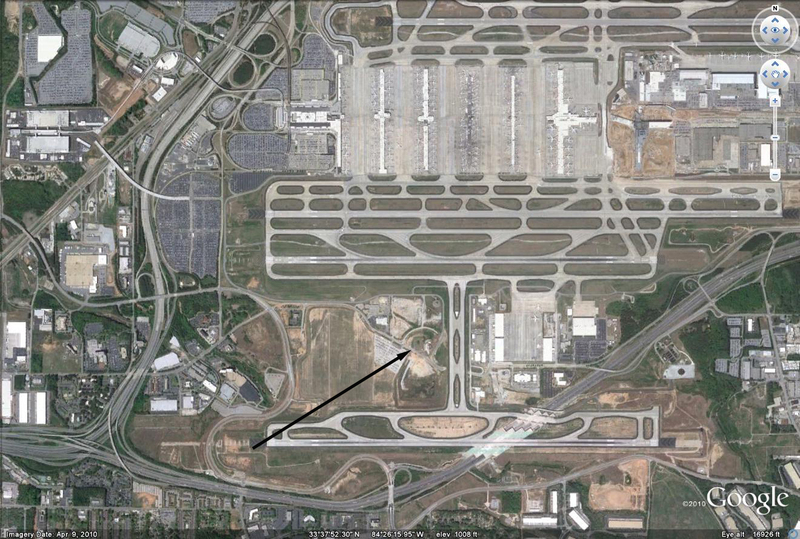 This areal view of the airport runways shows the location of both cemeteries, the black arrow runs between them. Hart is on the lower left and Flat Rock is on the upper right. Photo courtesy of Google. When the archeological study was done on Hart Cemetery in 1995, they discovered 83 graves were buried there. Only 16 had any kind of inscribed marker. A number of them are marked with simple field stones. Two giant magnolias stand watch over them. Hart cemetery looks quite different today. It feels somewhat desolate there. The incessant spring and summer rains have left the ground muddy and rough. An island of land suspended in time among rising green mounds, with the whine of jumbo jets flying overhead, it is a surreal atmosphere. One that left me feeling empathy for those with loved ones there. Yes, it was kept intact. But it will never be the same. 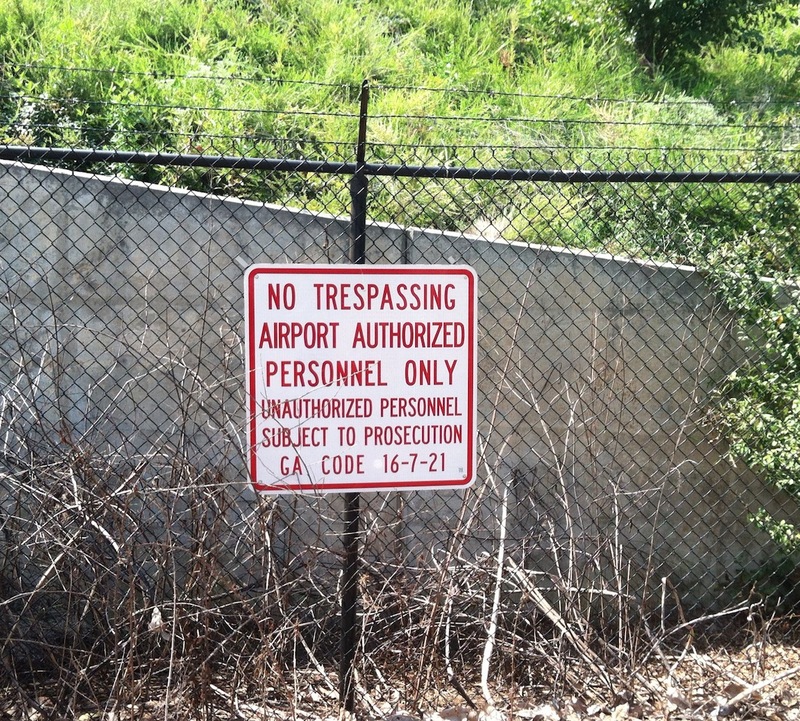 This sign reminds you that you are only a handful of yards from a gigantic runway. 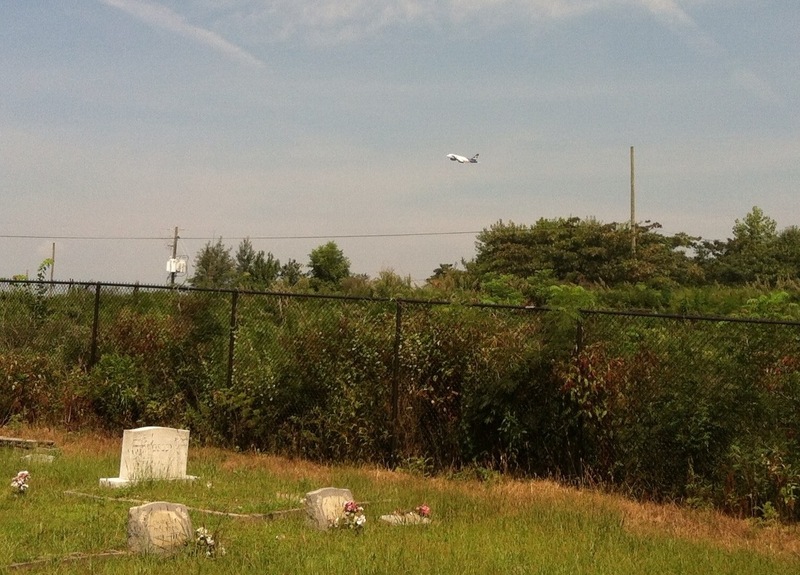 Takeoffs are frequent when you’re visiting Hart Cemetery. Flat Rock Cemetery is located deeper within the labyrinth of airport roads (see map above). The cemetery sits amid the cacophony of rumbling cement trucks, speeding tractor trailers and various aircraft overhead. With over 300 graves (most with markers), Flat Rock Cemetery feels more natural than Hart Cemetery, if that’s possible. It’s a grassy plot of land that is tended fairly well. Someone was mowing the grass on the far side of the property during my visit. From this direction, Flat Rock Baptist Church Cemetery looks pretty normal. Then you look in this direction and see the concrete plant. That’s when you realize things have changed quite a bit. History has it that John Hart (mentioned previously) and his second wife, Elizabeth, helped establish Flat Rock Baptist Church in the 1870s. 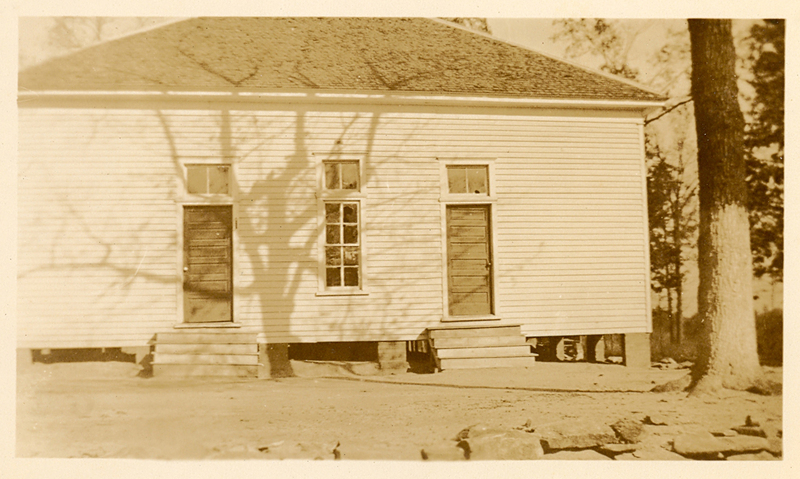 Although Flat Rock was never a Primitive Baptist congregation, they met in a plain building in the tradition of the Primitive Baptists, devoid of ornament or religious pretension. It was built with two entrances, each approached by three wooden steps with no landing. It’s not known if they were ever used to divide the sexes. As the Atlanta airport expanded and I-285 was built in the 1960s, much of the old Flat Rock community was destroyed. By the 1970s, the congregation was looking to relocate. They sold the property to the airport authority in 1979 and re-established themselves as National Heights Baptist Church. The church and Sunday School building were still used by various airport agencies before being abandoned, then finally torn down in 1996. The cemetery is still active. 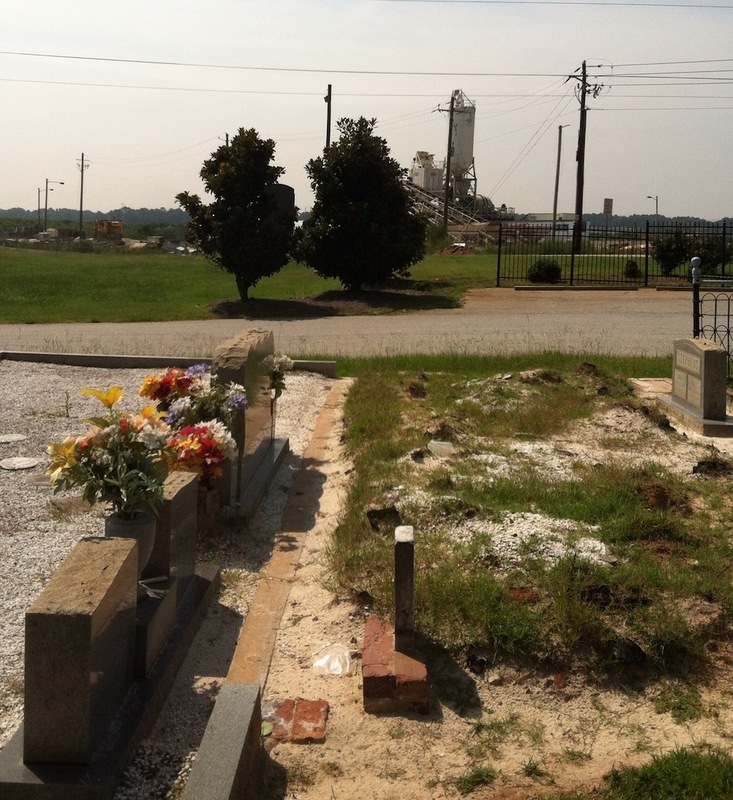 I was able to take a photo for Find a Grave that was for a burial in 2012. There’s a good bit of space available. Several descendants of the Hart family (and others with kin who grew up there) still live close to the Flat Rock area. I’m willing to bet some of them will be buried there when the time comes. It’s comforting to know that these two cemeteries remain intact. Other cemeteries have met much sadder fates. In 1956, Monument Cemetery in Philadelphia was pretty much wiped out, most of the graves destroyed. Why? To add a new parking lot to Temple University. It’s a heartbreaking story. At the same time, it’s a situation that leaves me torn. I only know that I’m glad my loved ones aren’t buried directly beneath some airplane’s flight path, silent witnesses to hundreds of unknowing travelers. I think I’d feel exactly the same way. My husband’s grandmother’s house was the last one bought and torn down in that area for the runway. We actually lived there until just before this was done in 2000. I am familiar with the Flat Rock Cemetery (his grandparents were active members at National Heights), but had never heard of Hart Cemetery. Thanks for a terrific and informative post! Hart Cemetery is an odd little duck. It looks like it needs a little TLC. I’m glad you enjoyed the story. Were his grandparents still alive when the house was torn down? I can’t imagine watching it come down. That whole area looks so strange to me now. I enjoy your blog very much being a cemetery fan myself. 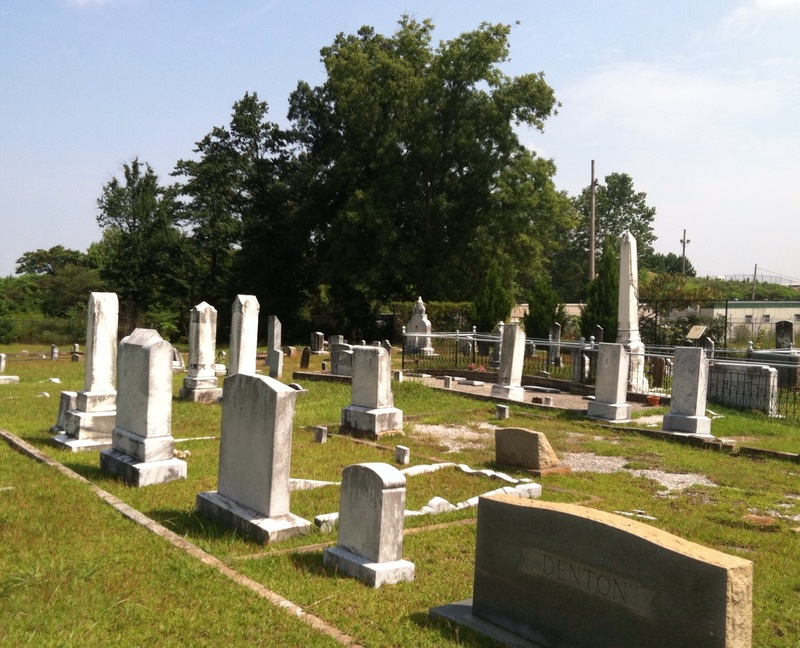 My great-great grandmother, Emily Collins Harrison, is buried at Flat Rock. I was there once years ago with my dad. At that time it was overgrown and a little hard to navigate. From your pictures, it looks better now. Sheila, I think the fact that it is now very visible on that road, people notice quickly if it is getting overgrown. Hart is a lot more isolated. It looks like there are enough surviving descendants still around to ensure Flat Rock stays well cared for. I appreciate you thinking of those of us with relatives buried at airports. My family has plots at Harrell Grove Cemetery in Chamblee, GA. It sits at the end of a runway at Peachtree Dekalb Airport. In 2015 we laid my brother to rest there. 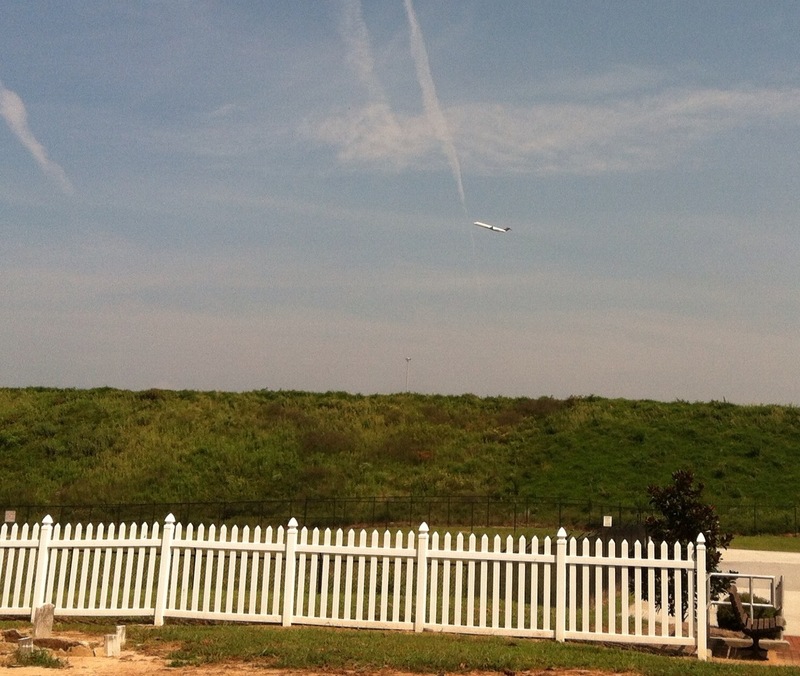 In some ways, the airplanes have became part of our journey through grief. We’ve started a tradition of having a picnic at the cemetery every year during their airshow. We have a great view from there and figured we might as well make lemonade from the lemons. Samantha, I just send you an email! I want to know more! Thank you for taking the time to post your comment, I truly appreciate it.